Allure Esthetic is proud to offer a transforming skin care line, developed by Dr. Sajan himself, to help address the skincare needs of his patients. His vision began when he had an ample number of patients that battled age spots and acne. He wanted to create a line that was clean, paraben free, and made with recyclable plastic. More importantly, a skincare line that worked. After hours of research and meetings with other healthcare professionals, Dr. Sajan had his formulations and proceeded with his skincare line. He understands that we cannot change the fact that we are aging, however, how we age can be addressed. Dr. Sajan wants to make sure that patients get the right skincare needed prior to surgery and post-surgery. “If the patient protects their skin, the results of our facial procedures can last longer; it’s like having them take out an insurance policy on a Face Lift”. Our pharmaceutical grade products are combined with bioactive ingredients, resulting in the highest quality of skincare. This allows us to provide a customized skincare regimen. Our line is developed to cater a variety of patients from Aging, Acne, Hyperpigmentation and Scar improvements. A generous amount of our patients is concerned with aging; we pride ourselves at Allure Esthetic on supplying our patients with the best on the market. Damaged skin can be detected in many ways from excessive saggy wrinkled skin, to sun damage (hyperpigmentation). What if you can help fight and reverse a significant amount of aging? With the correct guidance, we at, Allure Esthetic believe your anti-aging goals can be achievable. We have lot of concern with your facial skin conditions to deal with. We have an effective solution for below mentioned skin disorders. CE Ferulic is added with vitamin E, vitamin C and ferulic acid to make it a more stable and effective topical formula. Research has shown that these two ingredients combined provide antioxidant benefits to skin while enhancing and providing a stable form of vitamin C (Ascorbic Acid). This combination promotes collagen production, while maintains youthful skin. Helping build a strong defense system against environmental damages, and free radicals. Some studies also suggest that vitamin C may help prevent and treat ultraviolet (UV)-induced photodamage. It’s also been shown that ascorbic acid may have effects on trans-epidermal water loss (TEWL) that prevent dry skin problems, ultimately. For most biological structures, free radical damage is closely associated with oxidative damage. Vitamin E is a fat-soluble that is very essential for the maintenance of healthy skin. Being having antioxidants properties (also known to be a reducing agent) vitamin E limit oxidative damage to biological structures by passivating them from free radicals. The vitamin E also has nourishing properties that helps the skin to maintain its integrity. It also contains Niacinamide (Vitamin B) that controls inflammation (which may be cause by a variety of skin conditions), increase elasticity, maintains evening skin tone and skin barrier strengthening. Niacinamide also targets acne at its very first stage (sebum oxidization) and prevents pimples. Vitamin B3 has become one of the most popular vitamins recently added to the cosmetic industry. 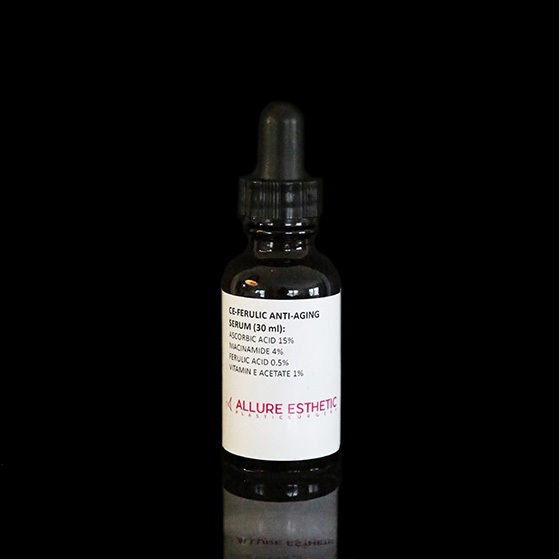 This anti-aging serum comes in a dark glass container to help preserve the integrity of the product. Making this powerful combination "a must have,” to aid your skin care needs." 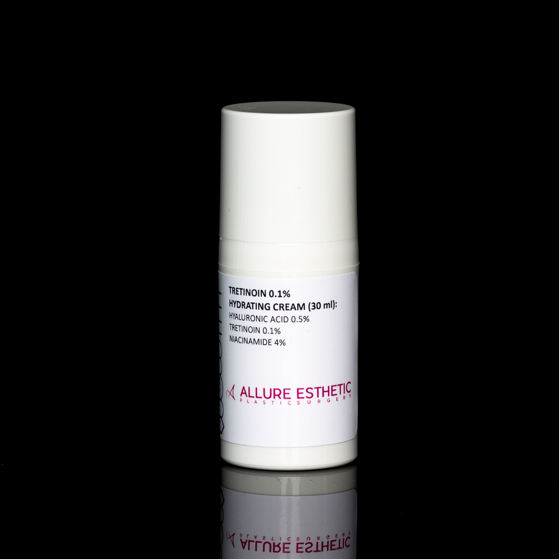 Tretinoin 0.5 % is designed for intense conditions of acne. Tretinoin has been one of the top antiaging creams prescribe in the dermatology industry for many years. It has also been one of the most effective creams to reduce sebum production, among acne patients. It may decrease the number and severity of acne pimples and promote quick healing of pimples that do develop. Tretinoin belongs to a class of medications called retinoids. It works by affecting the growth of skin cells. Tretinoin also contribute to decreases cohesiveness of follicular epithelial cells with decreased microcomedones (dead skin cells begin to accumulate inside the pore, the cells become sticky and get stuck inside the pore and form a plug) formation. This unique formulation designed specifically for our patient’s skin that stimulates mitotic activity and increased turnover of follicular epithelial cells causing extrusion of the comedones, however does not dry out the skin like other formulations can as dry skin may also contribute to promote many other skin conditions. What makes this tretinoin different? It has one of the most hydrating ingredient in skin care, Hyaluronic Acid or HA. Hyaluronic Acid is one of the most interesting ingredients in skin care, specifically. We have also added Niacinamide Acid (vitamin B3) having nourishing properties that helps the skin to maintain its integrity, has become one of the most popular vitamins recently added to the cosmetic industry. It is also known to help prevent ageing. This is one of the key components to assisting the skin appear smooth and preventing it from flaking. This Product is to be used at night, and SPF should be used on a daily basis. This new formulation is one of our top sellers, the development of this cream had to be done just right. In order to have a cream that all skin types can benefit from, we had to address all areas. The focal point of this moisturizer was designed to improve most areas of interest, when it came to skincare. A direct repair for anti-aging, inflammation, hyperpigmentation, and healing was developed. With a concentration on diminishing fine lines and wrinkles, smoothing out texture, and skin tightening. It has the ability to stimulate the skin’s natural mechanism to produce collagen. Collagen is a protein produced by our cells that helps “hold” the skin together, keeping it looking younger and giving it firmness and elasticity. Thus, providing a better skin care treatment to fit all skin types regardless of age, gender, or race. This nourishing Anti-Aging Firming Cream contains ceramides, to help trap moisture and restore by protecting the skin barrier. Ceramides are actually the major lipid constituent of lamellar sheets present in the intercellular spaces of the stratum corneum. These lamellar sheets are thought to provide the barrier property of the epidermis additionally ceramides play an essential role in structuring and maintaining the water permeability barrier function of the skin. Thus, providing a strong protective role for the sensitive skin nature. However, most skin disorders that have a diminished barrier function present a decrease in total ceramide content with some differences in the ceramide pattern. The combination of high performance bioactive plant based, antioxidants, peptides, and vitamins in the innovative formulation isolating us from other companies. Here we have another innovation for your skin. This is your triple threat Hyperpigmentation cream with its prescription grade Hydroquinone 6%, Tretinoine 1% and Kojic Acid 4%. This formulation will even out your skin and reduce the signs of aging. Tretinoin being a form of Vitamin A, its antiaging properties improving texture and wrinkle. Its receptors include those that control cell growth and the manufacture of proteins such as collagen and elastin, which are two fibers that give skin its elasticity. In addition to encouraging growth, tretinoin inhibits the production of an enzyme that breaks down collagen and elastin. These strong inhibitors of melanin have been proven to work best when used together to even out discolorations and reverse signs of aging. Among melanin inhibitors hydroquinone and kojic acid are on the top. Hydroquinone competitively inhibits melanin synthesis by inhibiting sulfhydryl groups and acting as a substrate for tyrosinase. Hydroquinone is considered the gold standard for the treatment of hyperpigmentation. Kojic Acid is another product that is a naturally occurring, hydrophilic fungal product derived from certain fungi it is also shown to have antioxidant activity that will enhance the depigmenting effect. Kojic acid along with inhibitory properties of melanin formation also have role in tyrosinase activity on alpha-stimulating hormone (α-MSH) induced melanin synthesis in B16F1 melanoma cells producing whitening and depigmentation effect. We encourage patients who want no down time with their skin peeling to even out skin tone. This Product is to be used at night, and SPF should be used on a daily basis. 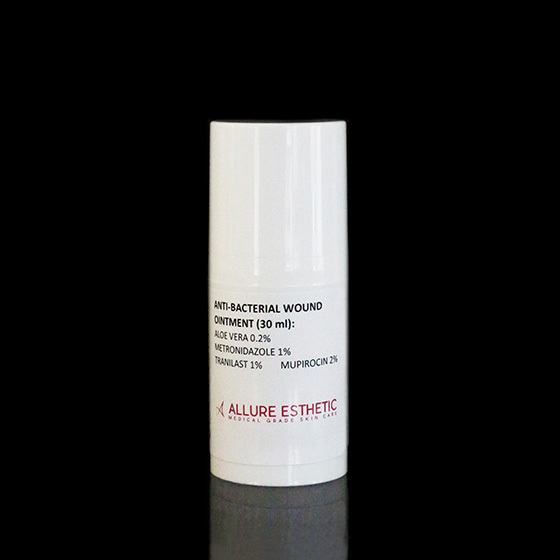 Our custom Antibacterial Wound Ointment is formulated to better treat your individual needs. The unique combination of active and inactive ingredients has been selected to produce an outcome that is clinically superior to that which is commercially available. Aloe Vera, Metronidazole, Mupirocin, and Transilast work in harmony to provide soothing, moisturizing, and healing properties for your wounds. Tretinoin 0.1% is designed to treat the early conditions acne and is light weighted. Tretinoin has been one of the top anti-aging creams prescribe in the dermatology industry for many years. It has also been one of the most effective creams to reduce sebum production, among acne patients. It may decrease the number and severity of acne pimples and promote quick healing of pimples that do develop. Tretinoin belongs to a class of medications called retinoids. It works by affecting the growth of skin cells. Tretinoin also contributes to decreases cohesiveness of follicular epithelial cells with decreased microcomedones (dead skin cells begin to accumulate inside the pore, the cells become sticky and get stuck inside the pore and form a plug) formation. Illuminating Eye Cream contains Arnica Montana that has been used for years in a variety of ways to decrease inflammation both orally and topically. Arnica, like caffeine has the ability to constrict blood vessels (as well as lymphatic vessels) that aids in reducing the appearance of dark circles, and puffy eyes. Vitamin K1 is a co-factor in coagulation process when applied topically. Improves microcirculation, increases blood flow and reduces inflammation around the eye. Many cosmetic surgeons believe strongly on the effectiveness of it in healing bruising after plastic surgery, and they encourage patients to start taking Arnica Montana for a period of time before surgery to help reduce these signs of bruising. Many people have been convinced it’s a great help, after trying and seeing the amazing results of this medicinal plant. Illuminating Eye Cream can be used daily to remove under eye dark circles and puffiness caused by tiredness, fatigue, and allergies. Illuminating Eye Cream is also incorporated with Coconut Endosperm harvested from young green coconuts, filled with amino acids and growth factors, featured for support tissue growth. Green Tea extract, added to have a potent antioxidant effect that fights with natural aging process and preventing the breakdown of collagen and UV damage. One of the most hydrating ingredients used in skin care to date is hyaluronic acid is also a part of this invention, that makes the formulation able to keep dry areas hydrated all the time. Vitamin C in the preparation helps brighten the under eye area as well, great when used under a concealer to correct any imperfections. This prescriptions strength Hydroquinone 6% and Kojic Acid 4% mix is known for reducing hyperpigmentation (brown spots). This product becomes one of the most favorites among our Melasma patients, to help control the challenges of this condition. Melisma is a common skin problem it causes brown to gray-brown patches on the face. Most people get it on their cheeks, bridge of their nose, forehead, chin, and above their upper lip. It also can appear on other parts of the body that get lots of sun, such as the forearms and neck. Melasma affects people in their younger ages usually. The brightening cream formulation contains strong inhibitors of melanin have been proven to work best when used together to even out discolorations and reverse signs of aging. Among melanin inhibitors hydroquinone and kojic acid are on the top. Hydroquinone competitively inhibits melanin synthesis by inhibiting sulfhydryl groups and acting as a substrate for tyrosinase. Hydroquinone is considered the gold standard for the treatment of hyperpigmentation. Kojic Acid is another product that is a naturally occurring, hydrophilic fungal product derived from certain fungi it is also shown to have antioxidant activity that will enhance the depigmenting effect. Kojic acid along with inhibitory properties of melanin formation also have role in tyrosinase activity on alpha-stimulating hormone (α-MSH) induced melanin synthesis in B16F1 melanoma cells producing whitening and depigmentation effect. We encourage patients who want no down time with their skin peeling to even out skin tone. This product should be used 3 week prior to dong Fraxel Restore/repair, to prevent post inflammatory hyperpigmentation. Contraindications with use of resorcinol or benzoyl peroxide. Helps heal, protect and reduces inflammation of the skin with its penetrating agents. It contains the natural astringent that removes oils from the skin allowing the skin to glow and stay hydrated once skin has been cleansed. In addition to removing oil, this product is also known to close pores and contract body tissues. It can be applied directly to the face to help tighten the skin. it will help close open pores and prevent dirt to clog them. It will also heal the pimple and prevent scarring. Men too use this in the form of aftershave applicant. It helps soothe the skin and heal minor cuts faster. No need to use a toner, this cleanser contains Witch Hazel that acts as a toner, help tighten the skin and known to reduce inflammation. Witch Hazel is one of the most popular natural acne treatments worldwide and is used in dozens of over-the-counter treatment gels, washes and lotions. Recent researches shows that it can be helpful in preventing the bacterial colonization that has a central role in the development of atopic dermatitis and intertrigo dermatitis, as well as other microbial skin conditions. The tannins in Witch Hazel helps tighten skin proteins which then form a protecting covering to promote skin healing and stop bleeding. This property makes it particularly useful for treating skin conditions like eczema. This Witch Hazel also act to perform as a moisturizer to improve hydration of the stratum corneum, or outer skin layer, to reduce water loss from skin and to maintain skin softness and elasticity. Hydrating Cleanser can be used to cleanse the skin pre-or post, ablative and non-ablative procedures. 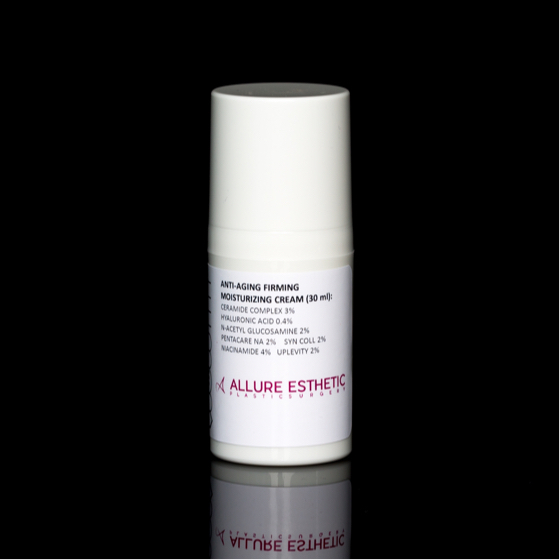 This Silicone Scar Cream is the perfect formulation to control your scars! Trimacinalone acetonide, Transilast and Pentoxifylline work simultaneously to battle the scar and promote better healing. Not only is blood flow increased, but also the delivery of oxygen therefore improving the rate of healing and circulation. Dry skin refers to skin that feels dry to touch. Dry skin is lacking moisture in the outer horny cell layer (stratum corneum) and this results in cracks in the skin surface. Dry skin is also called xerosis, xeroderma or asteatosis (lack of fat). Dry skin gives rise to bacterial growth and other infections. Dry skin can affect males and females of all ages. There is some racial variability in water and lipid content of the skin. Aging skin changes as you age. You might notice wrinkles, age spots and dryness. Your skin also becomes thinner and loses fat, making it less plump and smooth. Aging skin describes the changes in the appearance and characteristics of the skin that occur as people get older. Ageing changes are particularly pronounced on the face and hands. Skin appears prematurely aged in people that are chronically exposed to sunlight, a process known as sun damage or photoaging. Acne is an irritating and sometimes painful condition especially in the face. Acne is a common chronic disorder affecting the hair follicle and sebaceous gland, in which there is expansion and blockage of the follicle and inflammation. There are several variants. Acne affects males and females of all races and ethnicities. It is prevalent in adolescents and young adults, with 85% of 16-18 year olds affected. However, it may sometimes occur in children and adults of all ages. Melasma is a common skin problem. It causes brown to gray-brown patches on the face. Melasma is a chronic skin disorder that results in symmetrical, blotchy, brownish facial pigmentation. It can lead to considerable embarrassment and distress. This form of facial pigmentation is sometimes called chloasma, but as this means green skin, the term melasma (brown skin) is preferred. Melasma is more common in women than in men; only 1-in-4 to 1-in-20 affected individuals are male, depending on the population studied. It generally starts between the age of 20 and 40 years, but it can begin in childhood or not until middle age. Rosacea is a chronic rash involving the central face that most often affects those aged 30 to 60. It is common in those with fair skin, blue eyes and Celtic origins. It may be transient, recurrent or persistent and is characterized by its color, red. There are several theories regarding the cause of rosacea, including genetic, environmental, vascular and inflammatory factors. Skin damage due to chronic exposure to ultraviolet radiation plays a part. Seborrheic dermatitis is another skin disorder that is a common, chronic or relapsing form of eczema/dermatitis that mainly affects the scalp and face. There are infantile and adult forms of seborrheic dermatitis. It is sometimes associated with psoriasis (sebopsoriasis). Seborrheic dermatitis is also known as seborrheic eczema. Dandruff is an uninflamed form of seborrheic dermatitis. Dandruff presents as bran-like scaly patches scattered within hair-bearing areas of the scalp.